The thymus gland is just above the heart, behind the sternum and between the lungs, and contributes to overall immune health as it produces white blood cells, particularly, mature T lymphocytes. 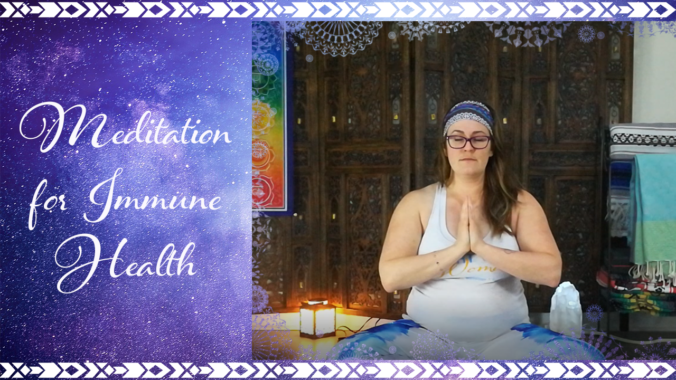 This short (1-3 minutes + closing breath) medical meditation from the kundalini yoga tradition helps stimulate the thymus, facilitating its production of white blood cells, specifically T cells, who fight off illness. As with any gentle or alternative medicine, its effectiveness reveals itself over time and practice, much like nutrition…One day of good nutrition will make you feel good, but a habit of good nutrition will pay off in dividends health-wise. 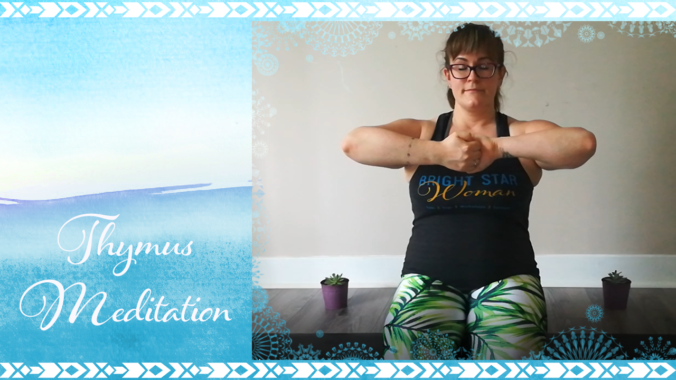 Give your thymus gland a little love with this meditation! If you enjoyed this video, give me a virtual high-five and like, share and subscribe to my YouTube channel! Winter has set in, and January can be synonymous with feeling run down and catching a cold or flu. Just before I feel the tickle in my throat, I like to practice this kundalini yoga meditation to give my immune system a boost. Its regular practice can stave off bacterial and viral attacks. This meditation works to help us overcome the blocks that form in our right hemisphere, slowing the flow of our innate strength (physical, mental, emotional, spiritual) to overcome life’s varied challenges. This specific combination of breath and mudras act on the sympathetic nervous system, allowing the immune system and right hemisphere to function optimally. According to kundalini wisdom, negative emotions such as anger and blame, who happen to lodge themselves in the right hemisphere of the brain and dampen immune function, are responsible for the interruption of energy flow (prana). It’s a quick yet efficient meditation with a few moving parts, but one can start with as little as 3 minutes. Sit in easy pose (sukhasana, in hatha yoga) with a mild jalandhar bandh (throat lock, as you pull your chin back slightly toward the cervical spine). Using surya mudra in your left hand, you can block your right nostril with your index and use breath of fire (agni pran) for 3 minutes (pumping the abdomen rhythmically with the movement of your breath). To close this practice, interlace fingers over the thymus gland (largely responsible for immune regulation) and as you hold your breath, try to pull your hands apart. Repeat 3 more times. It’s recommended by the 3HO Foundation (Yogi Bhajan’s legacy organization) to wear something on your head to avoid headaches. Give this immune therapy a try and see how you feel! If you enjoyed this video, give me a virtual high-five and subscribe to my YouTube channel!